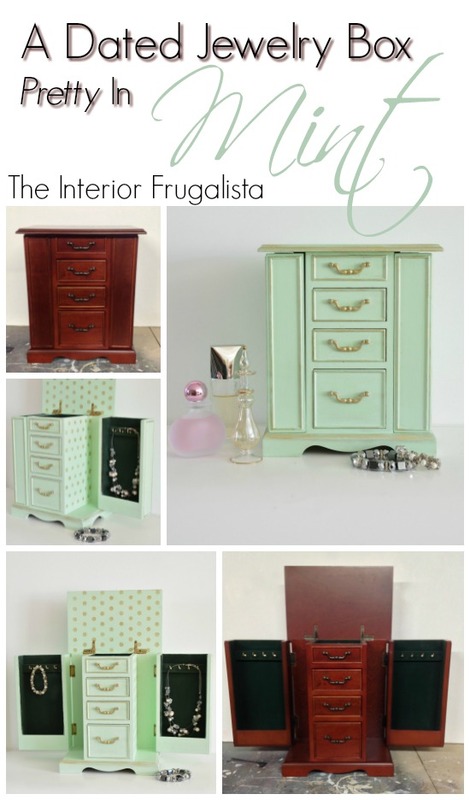 Remember last week when I painted a client's dining room hutch in the color Pistachio? Well, I loved the mint color so much that I had to try it on another piece. 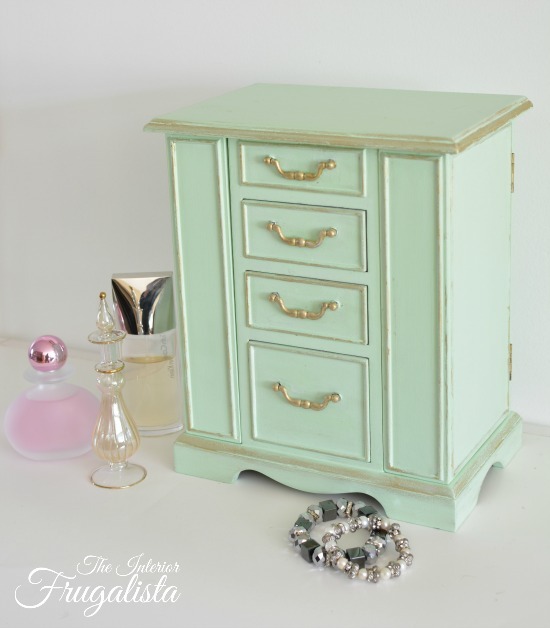 Unfortunately, I used the entire can of pistachio on the hutch so I mixed a custom mint color for this piece. I've been working hard at getting some smalls ready to sell, along with my furniture pieces, at a local outdoor market in May. 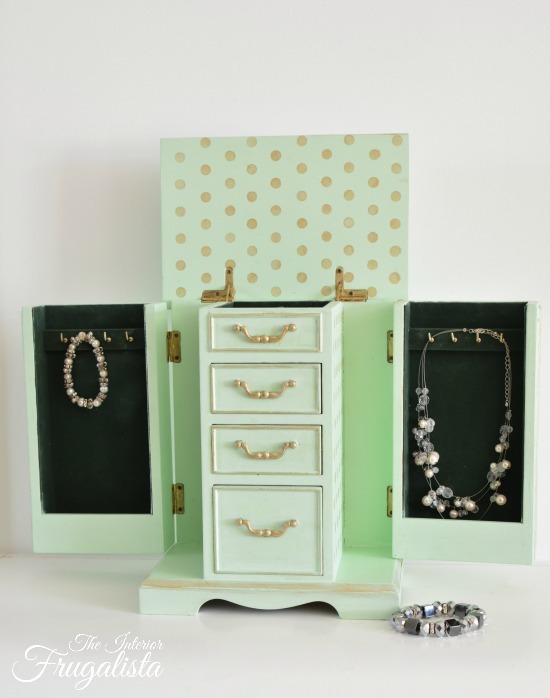 I have a box full of old jewelry boxes - they come a dime a dozen at thrift stores. I love breathing new life into these guys and they've always been a good seller for me. 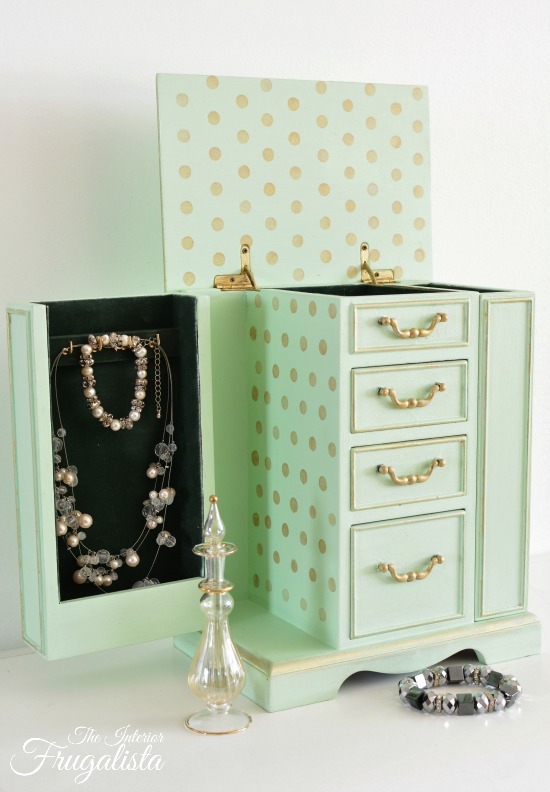 This is what the jewelry box used to look like. 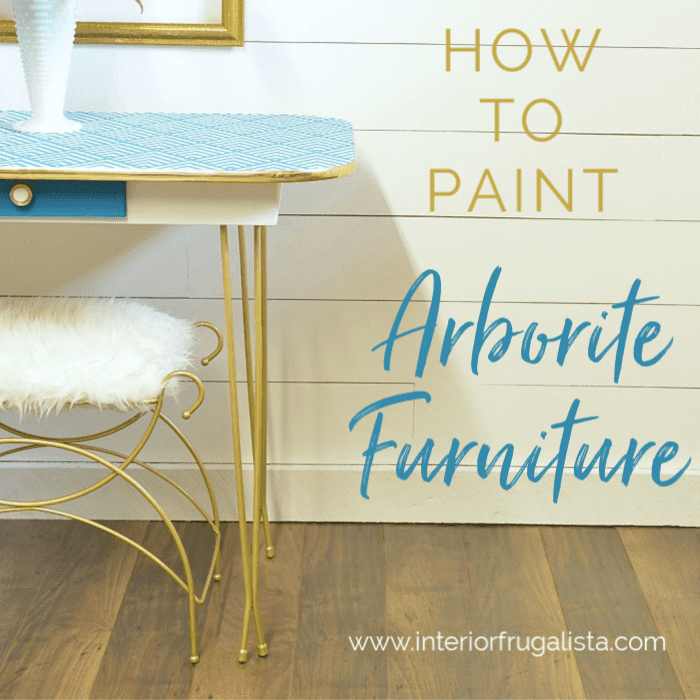 While I wasn't thrilled with the Forrest Green felt inside, I needed to find a way to make a custom chalk paint color in a tint that worked with the dark green. I think Mint fit the bill perfectly! 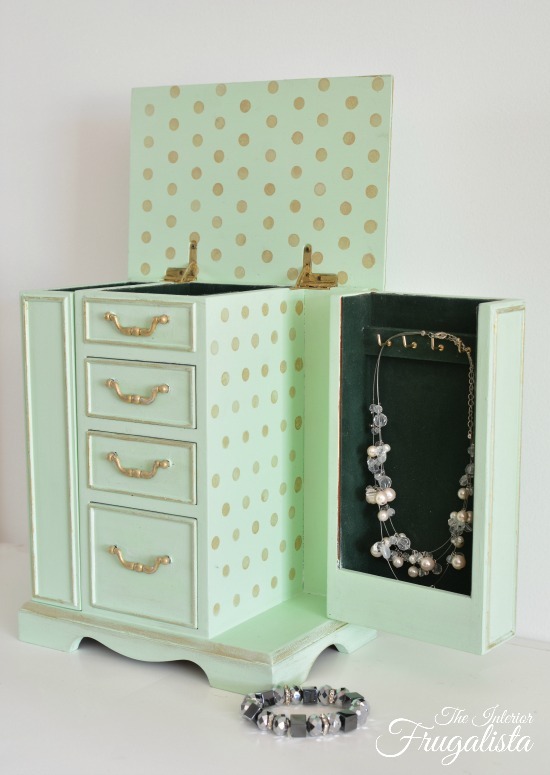 I couldn't resist adding an element of surprise when you opened the jewelry box so I stenciled metallic Gold polka dots. Unfortunately, the hardware could not be removed to spray paint so instead, I rubbed them with Empire Gold Gilding Wax. I protected the entire piece with White Wax to soften the color even more. For added detail, I rubbed the gold gilding wax with my finger along the raised ridges. Now I have a question for you guys. If you look at the next two photos, do you think I should continue the polka dots down the back of the interior? I wish I could remember the ratio I used for the custom paint color. 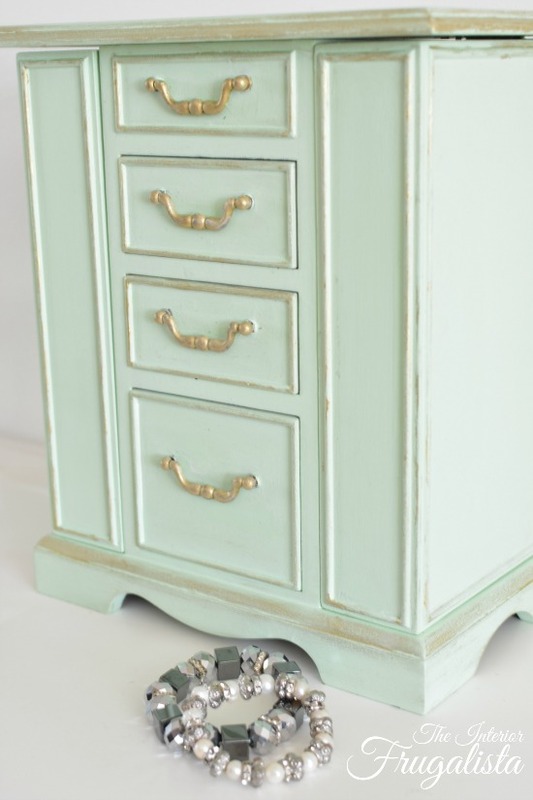 What I used was Annie Sloan Chalk Paint­ in the color Pure White and then kept adding a teaspoon at a time of the color Antibes Green until I was happy. 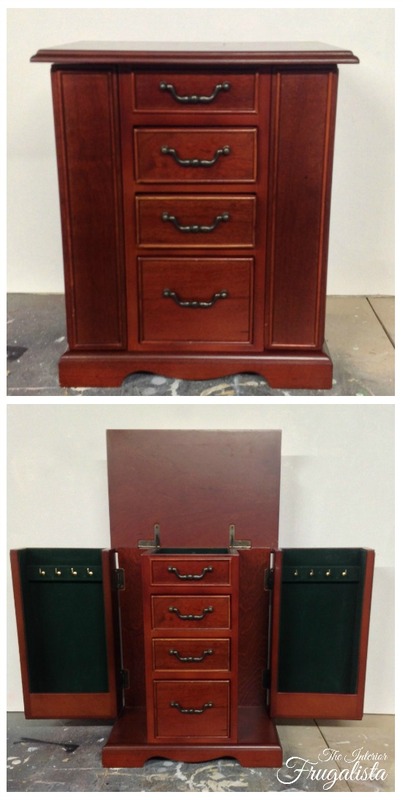 I hope this jewelry box finds a new home in May. 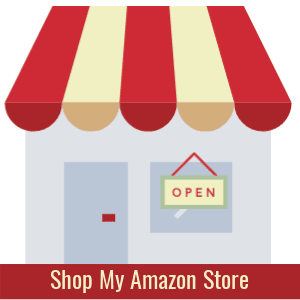 For my local blog readers, I'll be sharing more details about the market next week so stay tuned. 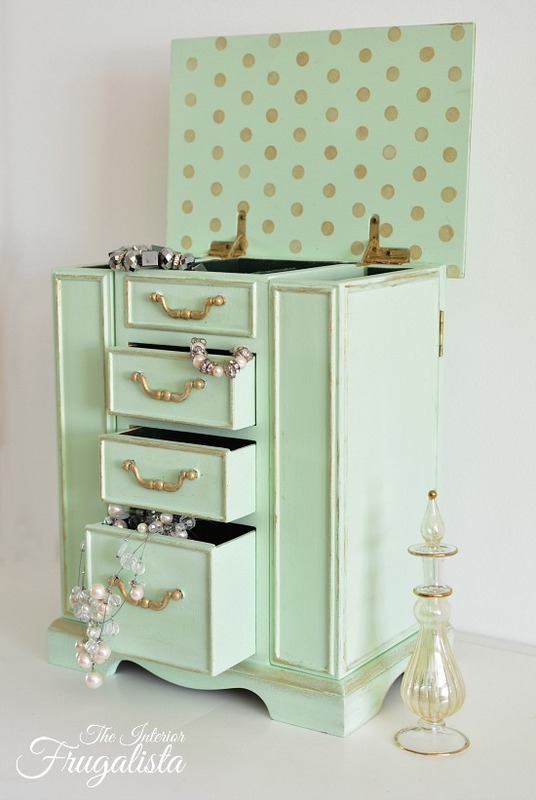 If you liked my Mint Jewelry Box Makeover please share it with a friend and/or save it on Pinterest. 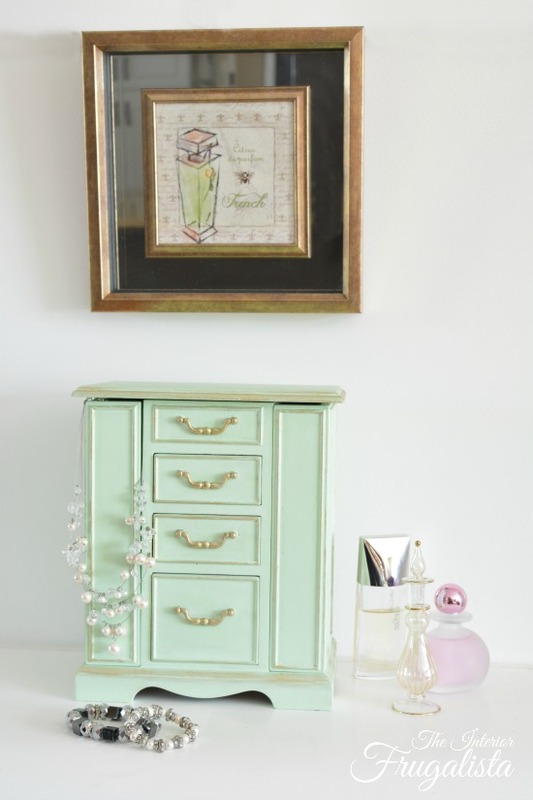 If you missed my client's hutch last week, you can see it here Mint Dining Room Hutch Makeover. 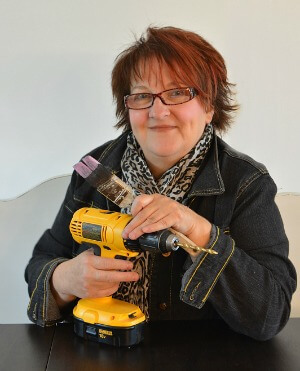 *I've included affiliate links to share some of the products I used along with similar products for this jewelry box makeover. Marie, that looks awesome! I never would have tho't of using that color. And I think I like the polka dots just on the sides and the inside of the top of the chest. Somehow I think putting them on the back too would look overdone. I have several thrift store jewelry boxes to make over but I have been a little intimidated I guess because I just can't bring myself to do the first one. Silly, huh? Now I'm thinking I might try one of them in this shade of green. I know once I get going I'll come up with more ideas for colors and patterns for drawer linings, etc. I just have to take the first step. I guess I could start by painting the first one I work on white and if I don't like it I could easily paint over the white with something else. So, thank for the inspiration! I'm gonna do it! I'll let you know how it goes. Naomi, it's just paint. Why start with white? 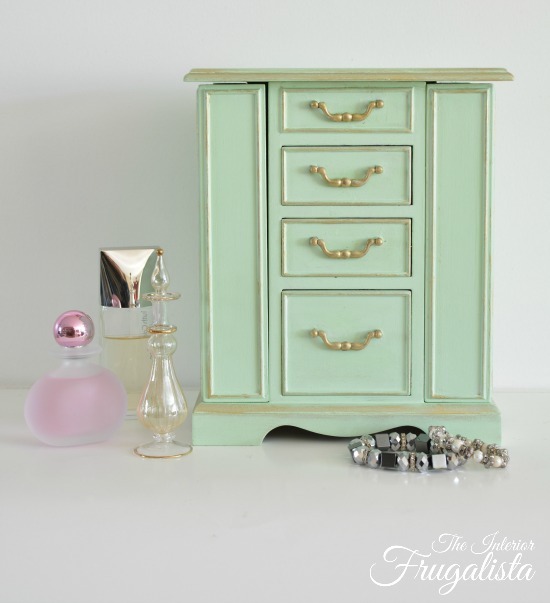 If you like the mint green color, go for it! Yes, please do let me know how it goes and if you have any questions while you're doing it, you know how to contact me 😉 You got this!